LONDON – The accommodations sector is highly seasonal, with school breaks, holidays and weather dictating youth and family travel. London’s hostel industry is no different. But viewing performance seasonally can reveal holistic trends in the data and where there may be room for growth. 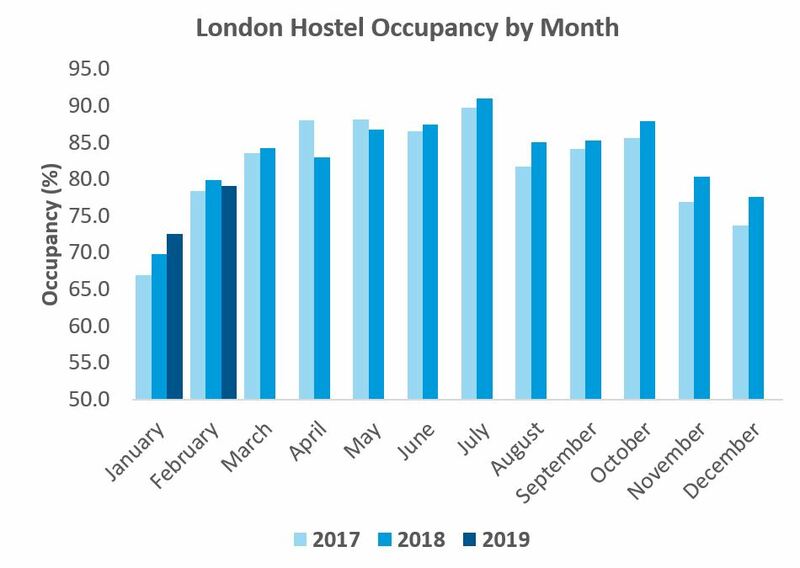 January is, was and likely will remain the slowest month for London hostels, with occupancy dipping below 70% in two of the past four years. Shoulder month February heralds the return of the traveler, with occupancies hitting the high-70s to low-80s. 2019 started off on the right foot, with January occupancy growing 4.0% over the year to reach 72.5%, and February ADR experiencing the fourth consecutive month of year-over-year growth. January revenue per available bed grew a healthy 6.5% from 2018, and February RevPAB added a modest 1.0%. Total revenue per available bed in February was £16.87, a 2.3% increase from 2018 and the fifth monthly consecutive increase. Ancillary revenue grew faster than bed revenue in February, which helped offset the minor -1.0% decline in occupancy. As we exit the slow season and move into spring and summer, travel historically increases. Spring in London is fairly unexceptional for hostel performance: occupancies continue to rise month-over-month as various school holidays in combination with warming weather increase travel. May, notably, tends toward strengthening occupancy but softening rates, which may represent an opportunity to increase ADR. It’s the summer period beginning in June and ending in October that is the bread and butter of London hostels, with occupancies in the high-80s to low-90s. June, July and August experienced year-over-year occupancy growth for each of the past two years, although ADR growth and thus RevPAB growth were more of a mixed bag. London hostels topped the charts with a staggering 91.0% occupancy in July 2018. The 1.4% increase in occupancy from 2017 was presumably influenced by a -2.4% year-over-year decline in ADR. As the number of beds available to sell continues to shrink as occupancy inches toward the 100% threshold, hosteliers are likely to realize pricing power during the high-demand summer months. August is perhaps the month most ripe for occupancy growth. Despite strong year-over-year growth – up 3.6% in 2017 and 4.1% in 2018 – August occupancy trails that of June and July. Rate sees similar softening, dropping to early-spring levels: August 2018 ADR dropped below £20 for the first time since March. As secondary schools and universities are generally on break during August, the month represents a prime opportunity for attracting student travelers. Occupancy creeps up again through September and October before dropping off in the cooler holiday season in November and December. Winter performance in 2018 was particularly strong, with occupancy rising 4.5% over the year in November and 5.2% over the year in December. These two months also saw the first positive ADR growth in 12 months. While seasonal trends are certainly present in London hostels, the market’s popularity mitigates the highs and lows found in more rural areas. With hosteliers filling three of every four beds more months than not, ADR will become the differentiating factor in hostel performance moving forward. STR reports on hostel performance in London and Amsterdam and is actively pursuing other markets. Reports are free to data providers. Interested in more information? Please contact Patrick Mayock at pmayock@str.com.